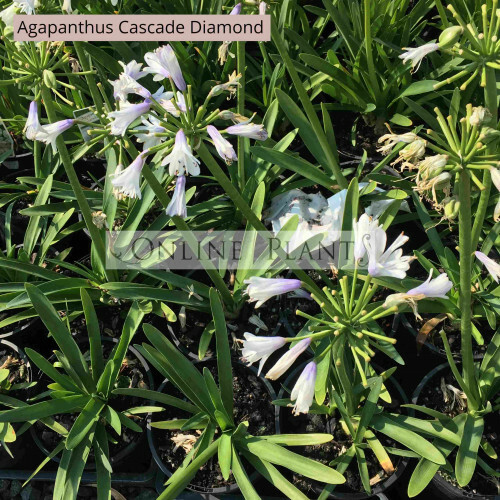 Agapanthus Cascade Diamond, as it names suggests has cascading white flowers. As the flowers age they slightly turn a pink tinge. 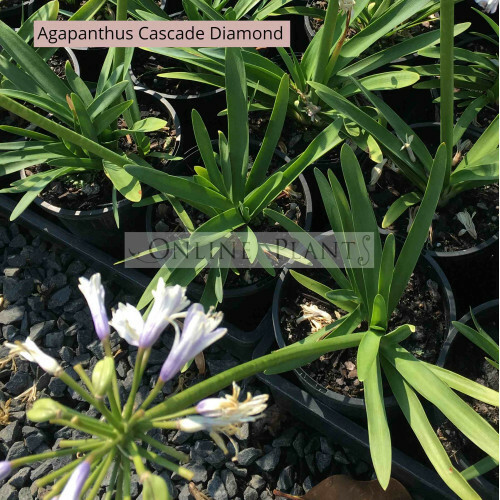 Great plants for a range of purposes, can be used for border edging in perennial gardens or even as a year round base for decidous trees such as Manchurian Pear. A very hardy species, tolerant of drought and frost. Grows to 50cm tall and wide with another 30-40cm for the flower head. Along with most plants in the garden will benefit from feeding twice per year with a complete plant food andliquid fertilizer. For further inquiries please use our free garden design service or email:store@onlineplants.com.au Available for fast delivery to your door in all Melbourne, Sydney, Adelaide, Canberra and Brisbane, metropolitan and regional areas.